Prevent cuts and bruises from sharp edges with edge protecting bumper guards that slide over the sharp edge and hold themselves in place. A cushion of foam rubber helps soften the blow and takes the bite out of sharp edges. Help reduce damage from light impact to walls and equipment with flat foam rubber bumper guards placed where impact is likely. For heavier impact, select a steel supported bumper guard where car doors might hit a wall or other similar impacts. Protect pipes and people with bumper guards that fit to the roundness of the pipe and hold in place with adhesive backing. 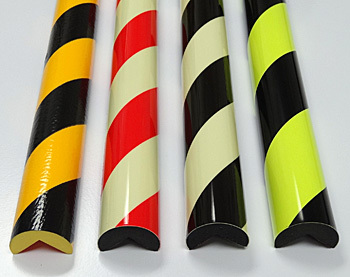 Helps prevent cuts and bruises from bumping into pipe, helps take the impact out of running into pipe with carts and equipment. Round - three-quarter and half round bumpers work well on flat and corner surfaces to help prevent workers from bumping themselves on sharp corners that can result in cuts and bruises. 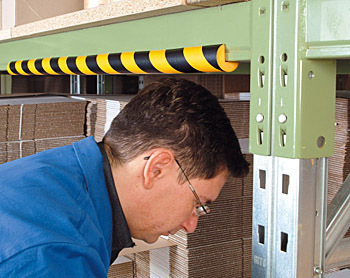 Flat - these bumpers can be applied to walls, flat fronts of racks, on equipment and carts to help prevent dents and scratches on walls as well as protecting workers from injury. Edge - slide these bumpers over sharp edges on rack and shelf & equipment supports where a bump might result in a nasty cut without the bumper in place.